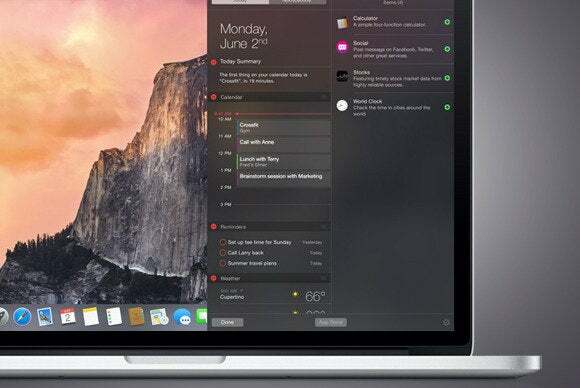 Notification Center has been a part of OS X for two years: It was introduced in Mountain Lion and expanded upon in Mavericks. 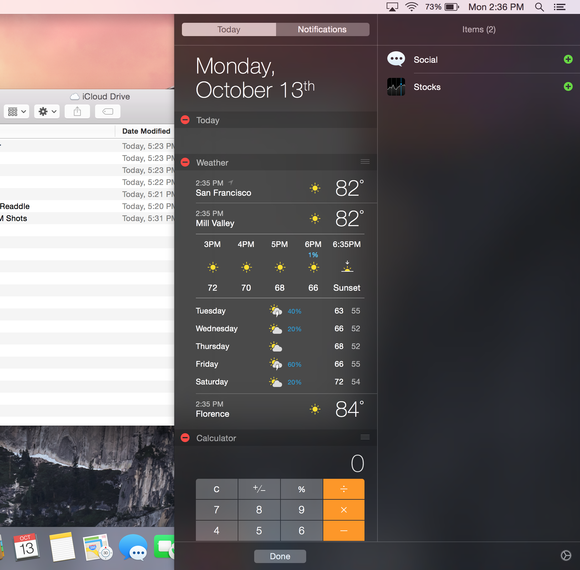 But with OS X Yosemite, Notification Center has transformed into something exponentially more useful than it was before. In fact, in Yosemite Notification Center is so different—and so much more useful than it was—that it probably deserves a new name. But I’m getting ahead of myself. Let’s start with the most fundamental of changes: With Yosemite, Notification Center no longer slides a Mac’s entire interface off to the left in order to pop out from the right side of the screen. Now, Dock-like, it slides in on top of the right side of your screen while you’re using it. The old approach was certainly dramatic, but I think this new one is a better metaphor. Once Notification Center slides in, you’ll notice a major change right there at the very top: As in iOS, there are now two tabs, one called Notifications (that’s the one you’re already familiar with), and one called Today. The Today tab is where all the exciting new additions to Notification Center live. Today takes its name from the same tab that was added to iOS 7’s Notification Center, because it was designed to give users a quick view of what’s going on today, such as how many calendar items they’ve got and when their next meeting is. That functionality is a part of the Today view in Yosemite, but it’s so much more than that. At the very bottom of the Today view is an Edit button; when you click on it Notification Center slides out even further, adding a second column on the right that’s full of items you can add to the Today view. You can also use this view to remove items that are currently in the Today view or re-order them. These items are Notification Center Widgets, just like the ones introduced in iOS 8. Apple provides nine basic widgets: Today summarizes what’s happening today in your schedule, as it does on iOS, and Tomorrow does likewise for the next day. Weather displays current temperatures and forecasts. Reminders shows you timely items from the Reminders app. Calculator lets you do addition and multiplication and other basic mathy things. Social lets you post to Facebook or Twitter, or send text via Messages. World Clock shows the time in various cities. Calendar displays today’s calendar items. And Stocks shows time-delayed stock prices. When you edit the Today screen widgets, a second column slides out showing all currently unused widgets. Some of these widgets are configurable. When you’re not in Edit mode and you move your cursor over some of the widgets’ title bars, a lowercase letter i in a circle appears. Click this, and you can modify that widget—adding or removing cities from the Weather or World Clock widgets, for example. Though many widgets are there just to be glanced at, you can interact with most of them, too. Clicking on a city in the Weather widget will expand it to show an hour-by-hour forecast, which is very much the behavior we’re used to seeing in Apple’s Weather app on iOS. If you click in the Calculator widget, you can click on its buttons or use the keyboard to do your math. The base widget collection is very much in line with what we’ve seen on iOS and in OS X’s Dashboard feature. But the great news is that the contents of the Today view can be supplemented with widgets from third-party apps. Standalone apps can supply their own widgets automatically. (If you bought, say, TLA Systems’s PCalc on the Mac App Store, its widget should appear automatically in the Items list.) In addition, there will probably also be a widgets-only corner of the Mac App Store. I’m excited to see third-party widgets. Apple’s are nice, but they’re a bit boring. The Weather widget doesn’t show forecast highs or lows without expanding the view. The calculator widget supports only the four basic operators and percentage. World Clock doesn’t offer a digital time view, nor is the list of clocks horizontally scrollable (so as you add clocks the widget just gets taller and taller). Reminders only shows items with due dates that are approaching, so undated items are ignored. I've enjoyed many of the new widgets released by app developers since the release of iOS 8, and I expect that the Mac will gain numerous interesting third-party widgets with the release of Yosemite. In fact, I'll wager that choosing just which widgets deserve to be in your Notification Center will be the bigger task. When Apple announced the changes to Notification Center in Yosemite, everybody seemed to have the same thought: That pretty much wraps it up for Dashboard, the interface layer for simple widgets that Apple introduced nine years ago as a part of OS X Tiger. Perhaps surprisingly, Dashboard still exists. You can enable or disable it via the Mission Control pane in System Preferences. But now we’re in the App Store era, and using the same technologies that power iOS and Mac apps seems like a far better choice—and that’s what you’ll find running Yosemite’s Notification Center widgets. If they seem a little like fragments of iOS apps, you’re not far off. Since iOS 8 also supports Notification Center widgets, I suspect we’ll be seeing a lot of the same widgets on both platforms. Apple’s thriving community of app developers should provide us with a vibrant selection of widgets, something Dashboard never really achieved—or at least hasn’t seen since the halcyon days of 2006. All told, Notification Center’s Today view seems like a great replacement for Dashboard, and a major benefit to OS X users. My only real complaint is the name on the package: Notification Center is no longer just for notifications, and the Today view is the landing place for widgets with information that goes far beyond what’s happening today. Sure, in iOS 7 the names made sense—but with Yosemite (and iOS 8) they just don’t fit anymore. This is a major new set of functionality—it deserves a name that fits.